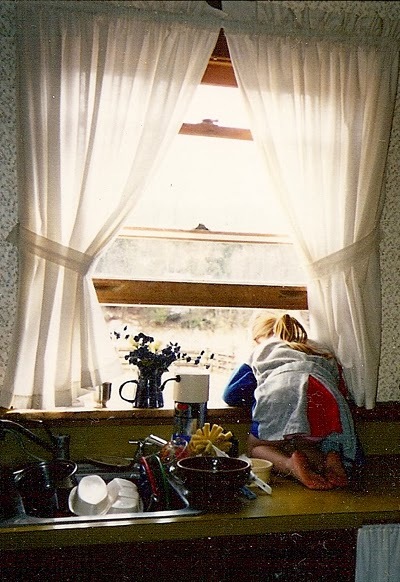 A favorite old picture of my daughter experiencing cabin fever! This is the time of year when the snow falls and grows deeper here in Vermont. If you are a wimp like me and no longer skate or ski and even fear sliding and slipping, cabin fever sets in and it is time to focus on busting isolation, boredom and lack of inspiration though these are the months I count on to clean my house, and tackle all those projects that I can't wait to get at.... until its actually time to do them. Christmas has past, our taxes are done and spring doesn't come for many long months and now I wonder about those pressing projects. Did I really want to complete the quilt I started that I am not so excited about now? Or am I really keen on cleaning out "rats nests" in the basement--piles of accumulated stuff that I still don't want to part with? Goodwill sometimes look good enough to recycle and I am hopelessly frugal? Inertia sets in, along with a bit of seasonal affective disorder, and just like Maria Wulf's chicken coop becoming cramped and crowded, I too find myself feeling equally as cooped-up. What happened to my desire to do all that I planned to do? My do-lists can be overwhelming and knowing where to start is difficult too! 1) Rest or nap to recharge my battery? Just got up? Think again! Proceed to number two option. 2) Set up to do one of those tedious, boring tasks that I need to complete. Clear out a space in front of a TV or computer and find a program series to distract and help me persevere. Programs that expand my world or brain seem to work the best to lift me right up and out of that "too-cloistered feeling". Watching the Olympics helps me take on a competitive spirit and I even begin to time myself as to how fast I can get the job done! 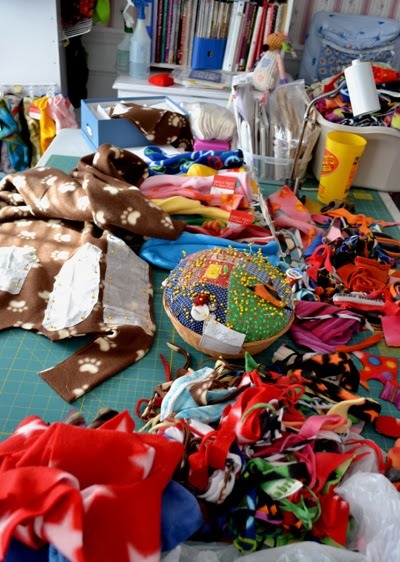 Repetitive cutting or sewing tasks can even be fun, if I turn them into a task-party and include my daughter on the other side of the table doing stuff that she too wants to finish. 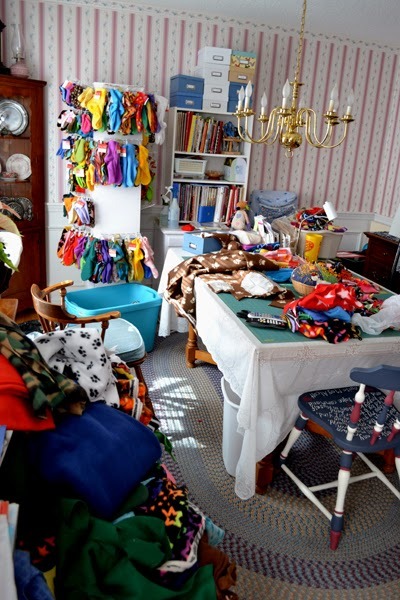 I think this is how quilting-bees or canning-bees turned cumbersome tasks into social gatherings to make the work get done fast and painlessly! 3) Sort dreaded jobs into piles of smaller tasks, making them easier to face and tackling one at a time with the least pain possible, and with a promise of a fun activity afterwards. 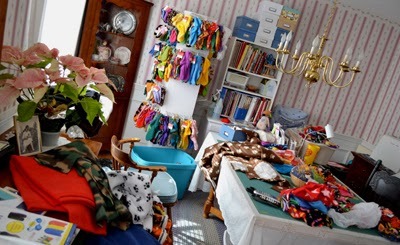 Sometimes the incentive I need to take on a "dreaded task" might be reclaiming the space to better use it, or cleaning out and finding materials to cut into pieces for patchwork quilts and kill two birds with one stone, saving space as well as turning my mess into something beautiful! 4) Take a bit of time to "moodle". Pinterest is perfect for dreaming and scheming but I keep my idea and do-list notebook nearby to take ideas to the next level. 5) Need to pick up the living area of the house? Schedule a friend to come for a simple afternoon visit. As my energies for such "wasted" tasks as cleaning are limited, I plan my monthly get-togethers with girlfriends for after my monthly pick-up and our house-cleaner's two-hour monthly cleaning is done and feel proud that I appear to be a good housekeeper when they come. 6) Isolation can lead to laxness in my personal appearance and grooming and giving into my pj wardrobe. Scheduling myself for a haircut, manicure or massage is often the boost I need. If my finances won't allow it, then a long luxurious shower or bath will do, taking time for the extra grooming and saturating my dry winter skin with lotion is a bit of elegance too. 7) Exercise needed? I combine it with my errands and make myself circle the perimeter of the store before stopping to shop. I even have a special shopping bag where I collect my coupons for my local stores, so all I have to do is grab it as I head out the door and get what I need on discount. 8) Too cold or icy to consider going anywhere? Exercise at home. A bit of cleaning, taking more steps and stairs rather than less. Putting items away provides stretching and reaching and with proper body mechanics can be a nice workout too. No pictures of myself, as my body make-over is anything but complete! 9) No ideas for dinner? I just need to take a bit of time to straighten my pantry shelves. I can easily plan a whole week of menus if I do! My favorite are one-pot meals that can simmer on the stove on a cold winter's day. 10) Too much to do and my mind too scattered? I take time to organize what needs to be done on paper first. This helps me focus rather than to get side-tracked--sadly I am that old! 11) When the walls get too close, its time to read and learn and expand my brain and world. Good TV programs are helpful too. This week I am watching the Olympics and Charlie White and Meryl Davis have inspired me to do a few ballet exercises and dream of skating once again (only in my dreams but being inspired to do few more exercises can't be wasted!) Alaskan wilderness programs, make me count my blessings, like indoor plumbing, and grocery stores and inspires me to make another warm quilt or two! 12) Prayer and reflection time, especially when I am blue, helps to alter my mood and count my blessings and turn sourness into gratitude. I make a point to give to God what is too much for me to carry, as well as pray for others and then move on to # 13. 13) Plan and do a random act of kindness for someone. It can be as simple as a phone call, writing a note or email or sending a small gift, anything that lets another know that you care. I learned years ago that this is medicine for my own soul. I also find that my own problems become smaller when I hear of the problems of others and a bit of kindness may brighten their day? Spring really will come and how nice it will be to have my winter and spring organization and cleaning tasks done early and get out for some fresh air!